The Formosa Garden is a communal garden behind houses on Warrington Crescent, Castellain Road, Formosa Street and Sutherland Avenue. Until c.1980 much of this area was within the Paddington Estate of the Ecclesiastical Commissioners, administered by Trustees. Developed in the mid C19th, much of the housing here had communal gardens provided for the use of occupiers of the surrounding houses. The large garden is triangular in shape and lined with plane trees, and has island beds set in lawn and a number of fine trees. Warrington Crescent, Castellain Road, Formosa Street and Sutherland Avenue were developed in the 1860s on land that was previously rural. The large garden is triangular in shape and lined with plane trees, and has island beds set in lawn and a number of fine trees. Until c.1980 the landowner of much of this area was within the Paddington Estate of the Ecclesiastical Commissioners, administered by Trustees. Developed in the mid C19th, much of the housing here had communal gardens provided for the use of occupiers of the surrounding houses. Management of the garden was by a Committee of occupiers and the expenses of maintenance were assessed proportionately on each house, with the Trustees having the power to undertake maintenance in the case of neglect. 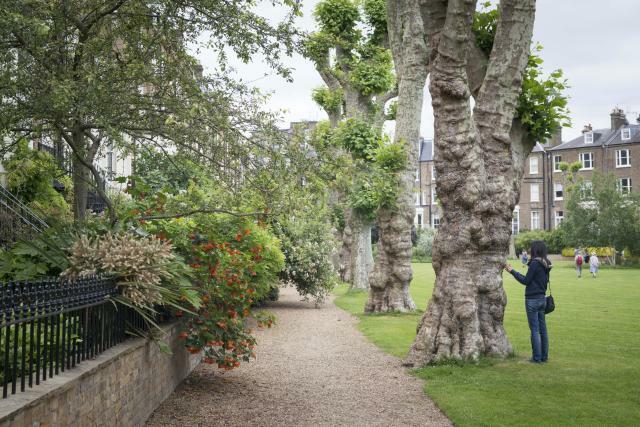 When the Church Commissioners sold the freeholds of their property in the area, they drew up legal arrangements as a means of preserving the special character of these neighbourhoods, including the gardens. They set up 12 amenity companies, each having Deeds and with a Rent Charge, to cover 12 areas. In respect of Formosa Garden, the agreement was drawn up between the Commissioners and Formosa Amenity Limited in December 1981, which continues to manage the garden. There are a number of other communal gardens in the neighbourhood, The Crescent Gardens and The Triangle Garden (q.q.v. ).